Demonstrations have taken place across Wales over President Donald Trump's decision to halt the US refugee programme. About 1,000 demonstrators gathered in Cardiff, with more in Swansea, Bangor, Aberystwyth and Cardigan. First Minster Carwyn Jones has said a state visit to the UK by the US president "should be put on hold". But the UK's Welsh Secretary Alun Cairns said he would welcome Mr Trump to Wales. Media captionGwilym Rhys, a member of the Welsh folk band Plu, said people were out in Bangor because "they're angry"
On Friday, Mr Trump signed an executive order indefinitely banning all Syrian refugees and suspending the entry of all nationals from seven Muslim-majority countries. The ban applies to nationals from Iran, Iraq, Libya, Somalia, Sudan, Syria and Yemen. Cardiff has one of the largest Somali communities in the UK. Youth worker Ali Abdi said: "I think it's important to get behind protests like this. Today it's the Muslims, tomorrow it could be any other community just like us who are going to be persecuted. "I think it's great to be standing side by side in solidarity." 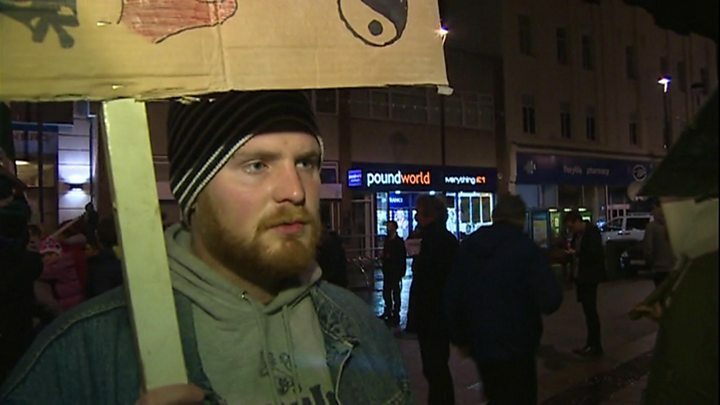 American student Ash Cox organised the protest in Cardiff. She said: "My ancestors on my father's side were Jewish immigrants seeking religious freedom. "For us to turn away those seeking religious freedom now is really hypocritical." Shavanah Taj, Welsh Secretary of PCS union accused President Trump of "normalising hatred, racism, bigotry, inequality and injustice." "That is not something we should be signing up to," she said. Katie Gill joined the protestors in Bangor. "If it makes the person who delivered my daughter - a man from Libya - feel a little more assured that people don't think the same, that's something in my eyes." Swansea protestor Bailey Ann said: "There could be a lot of young people that agree with Trump that will start being nasty to people of the same age from a different culture. "There's no need for it. We should all be living in a peaceful, sound world." 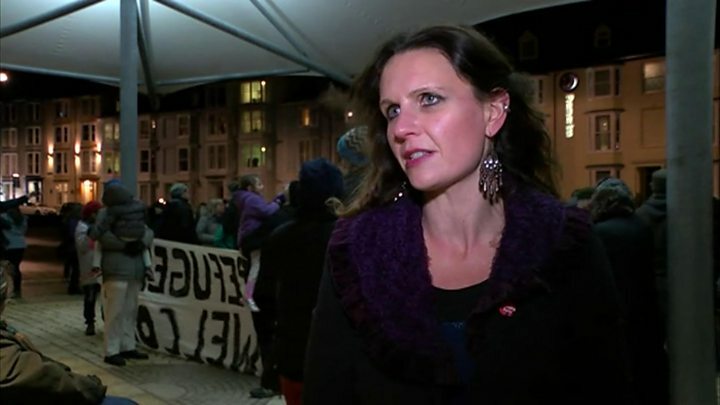 Former Plaid Cymru assembly member and chief executive of Youth Cymru, Helen Mary Jones attended the protest in Cardiff. She said: "A lot of young people in minority communities are feeling really frightened in this kind of environment and they need to hear the message that we're sending today. "Refugees are welcome in our communities and we won't put up with people not being allowed to travel because of the colour of their skin or the faith that they believe in." Downing Street has rejected calls to cancel the state visit, saying it would be a "populist gesture". Mr Jones has told Prime Minister Theresa May that a state visit from Mr Trump would be "difficult in current circumstances" at their meeting in Cardiff on Monday. He said the UK has to "deal" with the US government, "but that doesn't mean we simply accept without criticism everything that is said." Mr Cairns said while he disagreed with the immigration ban, he would "of course" welcome Donald Trump to Wales. He told the BBC's Good Morning Wales programme that "positive engagement" was the best way to work with the new US president. 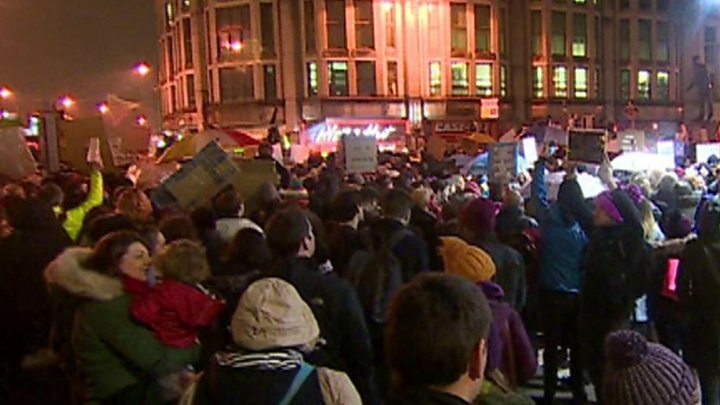 Protestors began gathering in Cardiff's Queen Street before 19:00 GMT on Monday, swelling to about 1,000 people despite the rain. 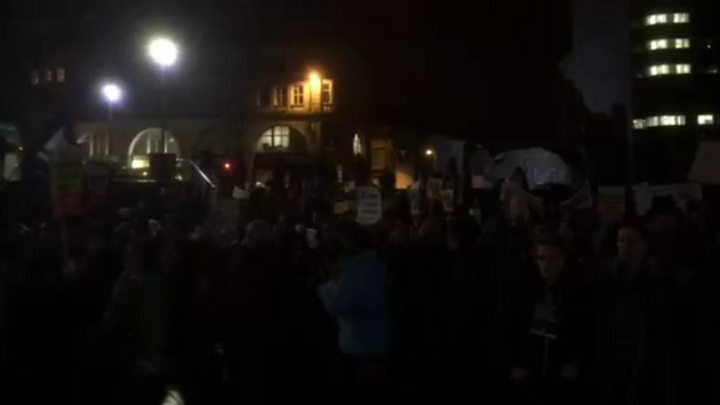 A further 700 demonstrators descended on events in Swansea, on Aberystwyth's prom, and in Bangor's city centre in Gwynedd. About 40 anti-Trump protestors gathered outside Cardiff City Hall where the Joint Ministerial Committee, which included Prime Minister Theresa May, was held earlier in the day. Some unfurled a banner reading: "Deals with the Devil", and as Mrs May left City Hall there were boos and shouts of "Theresa the Appeaser". Plaid Cymru leader Leanne Wood said: "Trump's actions have rightly been met with anger around the world and should be condemned without reservation by us all." Shadow Defence Secretary Nia Griffith told the House of Commons she was "embarrassed and ashamed" by Theresa May's decision to "hold Trump's hand instead of holding him to account". She said: "Her belated and limp reply of 'we do not agree' was pathetic."